As of late, a lot of smart TVs come with a bunch of apps (like the Vizio E3201-A0 which we reviewed Vizio E320i-A0 32-inch Smart TV Review and Giveaway Vizio E320i-A0 32-inch Smart TV Review and Giveaway To test out whether a TV can be feature-filled yet affordable, I bought myself a Vizio E320i-A0 32-inch 720p 60Hz LED Smart HDTV, which came in at $288 ($290 at retail price). I tested it... Read More ) that allow you to use services such as Netflix, Hulu, YouTube, and more. If you don’t have one of those TVs, you can also resort to other devices in order to provide the same (or better) functionality, such as with the Chromecast (read our review Google Chromecast Review and Giveaway Google Chromecast Review and Giveaway We're giving away a Google Chromecast, so read through our review, then join the competition to win! Read More ), Apple TV (our review Apple TV Review and Giveaway Apple TV Review and Giveaway Apple introduced its set-top digital media player in 2007, and it's currently on its third generation of hardware. Read More ), or any Roku device (we reviewed that too Roku 3 Review and Giveaway Roku 3 Review and Giveaway As more content becomes available online, the need for a traditional television subscription may not be enough anymore to justify the costs. If you’re already subscribed to services like Netflix or Hulu Plus, now may... Read More ). But none of these devices do is let you play games and they’re also restricted to apps designed specifically for the particular platform. The BiggiFi, which retails for around $60 on Amazon, tries to solve those two problems. Keep reading this review to find out whether the BiggiFi is a good addition for your home. And at the end of this article, you’ll be able to enter our giveaway for a chance to win one! The BiggiFi advertises itself as a “family smart stick”, but in reality, it’s simply just a mini-computer crammed into a dongle form-factor that can run vanilla Android. Despite the perceived simplicity of this solution, it actually addresses the gripes we named above. Through a pure Android environment, you have access to any Android application, including games as well as apps that aren’t designed to run on the Roku or Chromecast. The Biggify is an exclusive device, no other TV stick provide the same functionality that it does. If you broaden your search to media box-type devices, you’ll find a few. For example, there’s the G-Box Midnight MX2 ($88 on Amazon) which offers the exact same advertised software features as the BiggiFi. There are also a few generic devices out there such as the “MX” Smart TV Box running Android ($65 on Amazon). The same software features apply here as well. However, unlike the BiggiFi, these two competitors are bulkier but they also offer more ports for connectivity. If you know that you’ll be solely connecting the device to your TV through HDMI, it’d probably be best to go with the BiggiFi as it’s the cheapest and most portable option. The packaging for the BiggiFi is extremely similar to that of the Chromecast. You get a nice little box, where you slip off the cover, flip over the covering flap, and you’ll have your device under the piece of paper welcoming you to the BiggiFi. Underneath the BiggiFi is a USB-to-micro-USB cable as well as a power supply. The BiggiFi is quite a bit larger than a Chromecast (I’d say roughly 50 percent bigger) with official dimensions of 4.8 x 1.6 x 4.8 inches and weighing 8 ounces. I suppose this is pretty reasonable, as it has to pack in an entire computer (or mobile device at least) along with the three ports that it offers. Speaking of which, there’s a micro-USB port that is used to power the device, a USB port which can be used to plug in anything (but most commonly it’ll be a mouse or a USB flash drive), and a microSD slot so that you can add additional storage space or view media. The bottom is perforated to allow for better ventilation. Getting the BiggiFi set up for the first time is supposed to be easy. 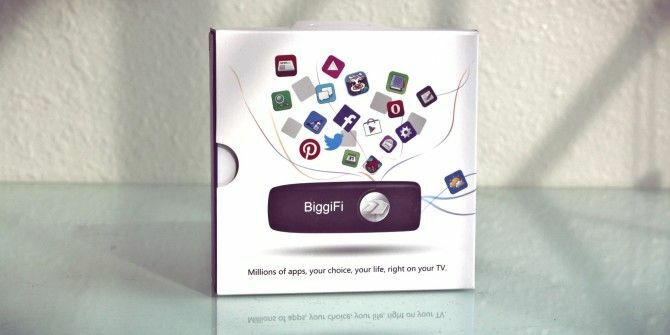 You plug it into the TV, make sure that the device is powered, download the BiggiFi app [No Longer Available], and then launch the app to connect to the BiggiFi. From the app, you can also choose whether you want to connect the BiggiFi to your WiFi network or just form a connection between your mobile device and the BiggiFi directly. At this step, I had several issues. At first, I’d try to connect it to my WiFi network, and the app would not display the dropdown list of WiFi networks. So to work around this problem, I connected my USB mouse to it, exited the instructional screen telling me to use the BiggiFi app on my mobile device, and then go into the Android Settings app and connect to my WiFi network manually. However, later on, it wouldn’t even connect to my WiFi network nor would it allow my mobile device to connect to it. I was forced to use the BiggiFi without Internet access and with only a mouse. If you do get it to work, whether it be via WiFi or a direct wireless connection, the BiggiFi app on your mobile device will act as a controlling device. With it, you’ll be able to use your mobile device’s screen to navigate the BiggiFi’s interface. There are two ways of interaction — touch mode and mouse mode. Touch mode works just like on any mobile device, but applied to the BiggiFi. So in this mode, whenever you touch your mobile device’s screen, it relays the input to the BiggiFi’s screen and interacts with it. This, I’ve found is a terrible way to use the BiggiFi because it’s impossible to determine where exactly you need to touch on your mobile device in order to correspond to the right location on the BiggiFi. Mouse mode enables the cursor in Android, so when you drag your finger around on your mobile device, you see the mouse cursor move but it won’t do anything until you tap on your mobile device to click. I found that the mouse mode works far better as you’ll at least be able to see the mouse cursor move around and therefore have a much better sense of where you are on the BiggiFi in relation to your mobile device’s screen. The only time touch mode was ever better was when I was playing certain games, such as Temple Run which is all about swiping in certain directions anywhere on the screen. But even for games like Angry Birds, mouse mode was the better choice. Perhaps what’s even better is if you use an actual mouse to control it instead of a mobile device. Performance was quite good within applications, at least at 720p resolution. My TV doesn’t go any higher than that, so sadly I wasn’t able to try out 1080p. Apart from running apps, the performance wasn’t quite as good — there was a lot of stuttering while swiping around, which wasn’t a great experience. This, however, is probably a cause of my next big issue with the BiggiFi. While wandering around the Settings app, I discovered that the BiggiFi runs on Android 4.0. Yes, you read that right. I find that Android 4.0 is inexcusable for a current device. Since the release of Android 4.0, there have been so many improvements that probably would have fixed quite a number of things that were wrong with the BiggiFi. I would have definitely preferred Android 4.4, but I would’ve let it slide even with Android 4.2. Worst of all, the system updater could not connect to an update server, so there is no way of upgrading to a newer version of Android. Saying that I wasn’t happy is an understatement. Another gripe that I have is that the device feels extremely unpolished. Not only is the mobile device app of lackluster quality, but so is the software on the BiggiFi. I do understand that providing a vanilla Android experience allows people maximum freedom and lets them customize the device however they want. However, since it’s already a bit harder to use than other entertainment devices, I would have liked to see an option between the vanilla Android interface and a customized interface that could have simplified the user experience. Even if it’s a (well-designed) list of installed applications, then users could just scroll through the list and pick the app they want to use. I understand that people may disagree with me and enjoy it just the way it is, but I just feel like something is needed to make it feel a bit more polished. Ultimately, I feel like there’s a ton of potential in the BiggiFi. It certainly has the right idea, and it could go very far. But with the issues I encountered and the severe lack of overall polish, I cannot say that it’s ready. After there’s been more work put into the device to iron out the issues and to provide a great experience, then I’d highly recommend it if it met those milestones. But it has a long, long way to go until it gets to that point. How Do I Win The BiggiFi? Explore more about: Android TV Stick, MakeUseOf Giveaway. Thanks, I prefer customized UI. BiggiFi looks promising. Stock Android so I don't have to learn any new tricks. Now everything I can do on my Android phone on the big screen with Biggifi. A custom interface for easy one click operation. I really don't have an opinion about your question. I prefer customised user interfaces. I prefer the customized interface. Overall, I like this product. I t doesn't look too bad to me. If I won one, makeusof would 'make my day'. I prefer the BiggiFi :D It's very interesting and I'd like to test it! You're assuming I know what the heck you are talking about. Im used to android so that would be my preference. Stock Android. Neat gadget but don't think I would spend the money on it. With stock android will be better I guess. No doubt it's a great gadget. I went to their website and they say Android 4.2 Jelly Bean in the specs, and in the FAQs they state they will provide Android updates. This giveaway one on 4.0 should update to 4.2.
i would try the customized one! It depends on how nicely done the interface is. If it is half-assed, then I rather have stock Android UI so I can customize it myself. I'd go with stock Android. Stock Android because reviewers seem to get upset when their android is a little different from the last android product they used and have to learn something different. BiggiFi looks like it can get netflicks on your tv and a few other unnecessary tricks. A customized interface would be a nice option, but I'd always like to fallback to a regular Android interface too. It will be interesting to see how things change with Android TV. why not ship it with the stock interface, but include the option to easily customize it for each user? Sure I prefer customized one. Great device. From your experience, and because it seems to me that a stock Android interface is designed primarily for mobile devices, I think that I'd prefer a customized interface on devices like BiggiFi. I always prefer stock android. I have never heard about someting like BiggiFi. Looks interesting! Thanks! Give me stock android any day of the week!